The Legend of Zelda: Majora's Mask is a true original. Other creators have had 15 years to copy its ideas, but inexplicably, nobody has. If anything, it feels more bracingly unusual now than it did back then, because mechanically or thematically, there's been nothing like it since. It is always a relief to return to a game that made an immense impact upon you in the past and find that it still retains its magic, but it is almost unheard of to find it improved by the passage of time. Three things form the core of Majora's Mask: masks, music, and time-travel. Collectible masks give Link, the taciturn boy-hero from Ocarina of Time, new talents that range from a heightened sense of smell to the transformation of his whole body. Musical notes played on his ocarina are imbued with an unexplained magic that allows him to manipulate the world around him. Time-travel, though, is the game's most revolutionary and least imitated idea. Termina — a surreal, compact world with distorted echoes of Hyrule everywhere you go — is doomed. A grotesquely grimacing moon is falling towards the earth and there seems to be no way to stop it. You have 72 hours — approximately one real-world hour — to make your mark upon the land before the world ends. After the opening section, you can play the Song of Time to reset things to the beginning of the First Day. Link keeps his non-consumable items and masks, but everything else (rupees, arrows, bombs, bottled fairies, friendships, dungeon progress) is gone, and the world resets to exactly how it was when Link first arrived there. The time limit that Majora's Mask enforces can be intimidating and stressful. Off-putting, even. The urgency of those first three days — during which you must regain both Link's true form, after the traumatic events of the opening sequence see him transformed into an eerie plant-child, and his ocarina — diminishes slightly once you gain the ability to reset time, but it is never possible to forget that the hours are ticking by. Special songs can slow things down to give you an extra hour to puzzle through a dungeon, or speed them up so that you don't have to wait around for something that you know is going to happen at 2pm, but you are never fully in control. There were plenty of occasions where I was still desperately rushing to get things done as the ominous final 5-minute counter appeared, knowing that if I played the Song of Time much of my progress would need to be repeated. It's tough going if you're not already familiar with the controls and iconography of 3D Zelda. It's only because I've played so much of it that my brain automatically fixates on unlit torches and visual cues like hookshot markers in dungeons, and that I know all about Z-targeting and trapping fairies in bottles. Even with all that familiarity, getting through dungeons in a single three-day cycle was sometimes a tight squeeze. There just isn't time to spend half an hour scratching your head over what to do next. It's like a test of your Zelda reflexes, and for those coming to this game fresh, there will be moments of frustration; it doesn't so much as explain the controls. There's a great deal of assumed knowledge. With every cycle, you become more intimately familiar with what goes on in Termina. This three-day snapshot sees the same people do the same things, every day, on the way to their inevitable doom, and there is a steadily building sense of unease. On the third day, the ground starts to tremble beneath you, shaking the screen. Wander around the normally bustling Clock Town at the end of the last day and you'll find it abandoned, as everyone flees from the grimacing moon. The only remaining living thing is the foreman of the construction workers, standing defiant at the foot of the clock tower, inviting the apocalypse. It is perhaps self-evident that Majora's Mask is a sad, sad game. It focuses much more on characters and their problems than any other Zelda, and some of their stories are profoundly touching. There is a sense of mortality and fatalism that permeates everything. When Link dons a mask that changes him into a Goron or a Zora or a Deku Scrub, he is taking the form of someone who has died — someone whom he'd met. The transformations themselves, should you choose to watch the short cut-scene that happens every time, seem torturously painful. Majora's Mask does not shy away from the macabre. Majora's Mask was developed in a fraction of the time devoted to its predecessor, Ocarina of Time — it was made in a single year. There was little danger that its development team would stumble under the weight of fans' expectations, because there were no expectations. It seemed to come out of nowhere. Even now, it feels like it has arrived fully-formed from a parallel dimension. 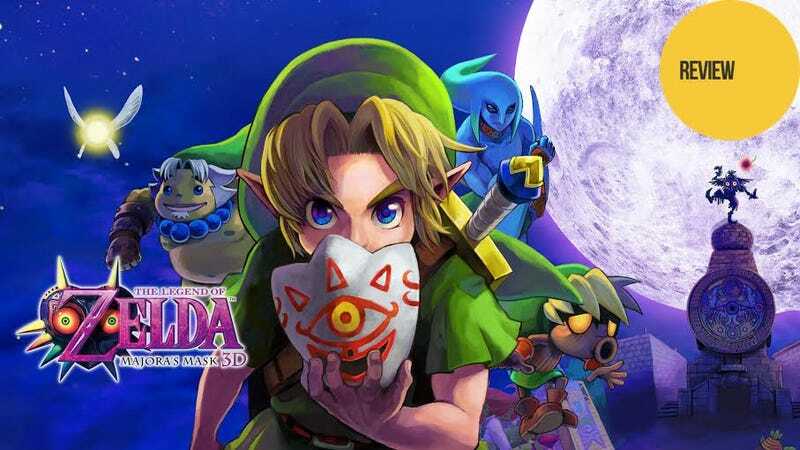 One consequence of this short development time is that Majora's Mask was always one of the rougher Zeldas, with frequent frame-rate catastrophes, a weird save system and a stubborn camera, but Grezzo's 3DS remake has fixed all that. The camera has been tamed, and now fully maneuverable with the New 3DS' C-stick. You should definitely play Majora's Mask on a New 3DS, if you can — having full control of the camera is transformative, but the 3D effect is also considerably better, and the strange, surreal color palette of Termina is just that little bit more vibrant. Occasional frame-rate dips still endure, but much less frequently. I encountered significant slowdown twice in 28 hours, once I got temporarily stuck on a piece of scenery, and there were a few strange moments with the lock-on targeting, but the technical improvements slap you straight in the face the second you walk out of the clock tower and into Termina proper. Textures, models, Link's face, draw distance; all are much improved, and on the 3DS' small screen it looks like a perfect little world. The atmosphere and strangeness of that world are what make Majora's Mask stick in the memory. As you gradually venture further from the walls of Clock Town, each new place you encounter is in a different state of doomedness. It's the last area, Ikana Canyon, with its abandoned houses and ancient, crumbling structures and air thick with spirits, that had the biggest effect on me. What happened there? Getting anywhere in Majora's Mask requires intuition and curiosity. The game expects you to have both of these things; it never tells you what to do, beyond sending you in a general compass direction. Not much happens unless you investigate and explore. A good half of the game is stuff that you will never see unless you go looking for it. The remake makes it slightly easier to keep track of all the characters and events you come across with an improved version of the Bomber's Notebook — a journal with a schedule and hints. But it still wants you to explore; it wants you to want to find things out. This is something I appreciate more today than I did when I first played it, now that I'm sick of being spoon-fed by games that worry you'll lose interest the second you get stuck. The Sheikah stone from the Ocarina of Time 3DS remake can be found in Majora's Mask, too — an elegant hint system that makes help available if you need it, but doesn't ever force it upon you. If you crawl into the stone, you can view "visions" that will point you in the direction of what to do next, but usually stop just short of actually showing you the solution to a puzzle. I resorted to them twice during my playthrough: once because I was totally lost in the Great Bay and once during the final dungeon, the Stone Tower Temple, which is easily one of the most convoluted and tricksy dungeons in Zelda history (if also one of the most inventive). It's difficult to be absolutely sure from memory, but some of the puzzles in Majora's Mask's four main dungeons seem slightly altered from their original versions. What's definitely changed are the bosses that lurk at the end of them. Each temple's boss now requires much more involved use of Link's transformative masks. This makes the first two encounters significantly easier than they were, making them feel rather inconsequential, but the final two have been beefed up significantly. Twinmold, once a deeply unsatisfying anticlimax at the end of the gruelling Stone Tower Temple, took me three attempts this time around. If you've not played it in a while, or haven't played it at all, Majora's Mask's sadness is striking. Small things remind you that this is not the same brave little Link from Ocarina of Time; this time he's a child with the weight of experience of a grown man, a boy who grew up, saved the world, and then was returned to his boyhood body. At the end of Ocarina of Time, the only friend he had who knew what he'd been through was Navi, his fairy, who disappeared as soon as he was returned to the Temple of Time. It is easy to see why the Link of Majora's Mask might be slumped dejectedly on his horse at the beginning of the game, riding through a forest far from home, in search of something. He is a deeply tragic figure, this Link, a boy who's had his identity stolen from him twice: once at the end of Ocarina of Time, when he is suddenly no longer a hero, and again at the beginning of Majora's Mask, when the Skull Kid steals his face and turns him into a grotesque little scrub. At the beginning of the game, he has to be wondering what to make of himself in a world that does not know what he has been through. Perhaps all these masks are a way for him to figure that identity out. I could talk about Majora's Mask for a lot longer, but really all you need to know is that you should play it. And don't rush through; savour it, explore, go hunting for masks and stories and pieces of heart. Even though I've played it twice before, it is still too bold to ever feel familiar. Majora's Mask seemed to signal an experimental new spirit for the Zelda series that never really materialized. It is still alone in the world of video games, affecting, inventive, and enduringly mysterious.